Southeast Asian American families and communities, along with immigrant, refugee, and families of color continue to experience the relentless attacks by the Trump administration on issues of education, health, immigration, law enforcement, census, and more. We are hopeful that states like California continue to fight back with strong proposed policies to protect Californians and ensure all communities can thrive. SEARAC is a co-sponsor of AB512, introduced by Assemblymember Phil Ting. Each mental health plan to prepare a cultural competency assessment plan to address, among other things, disparities in access, utilization, and outcomes by race, ethnicity, language, sexual orientation, gender identity, and immigration status. A mental health plan to convene a committee for the purpose of reviewing and approving the cultural competency assessment plan, as described. A mental health plan to submit its cultural competency assessment plan to the department every 3 years for technical assistance and implementation feedback, and would require the department to post the cultural competency assessment plan submitted by each plan to its internet website. The State Department of Health Care Services (DHCS) to consult with the Office of Health Equity and the California Surgeon General to review county assessments and statewide performance on disparities reductions. The DHCS to direct an external quality review organization to develop a protocol for monitoring performance of each mental health plan, as described, and would require the plan to meet specified disparities reduction targets every 3 years. The bill passed unanimously out of Assembly Health Committee and is moving to Assembly Appropriations Committee in May. 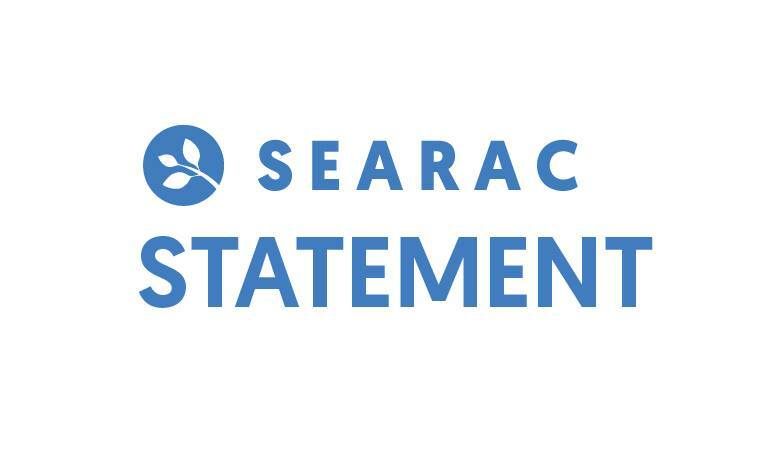 To submit a letter of support, contact SEARAC Policy Associate Lee Lo at lee@searac.org. On Jan. 10, California Gov. Gavin Newsom proposed an additional $54 million for community outreach and education on top of the $90.3 million approved from last year’s budget. 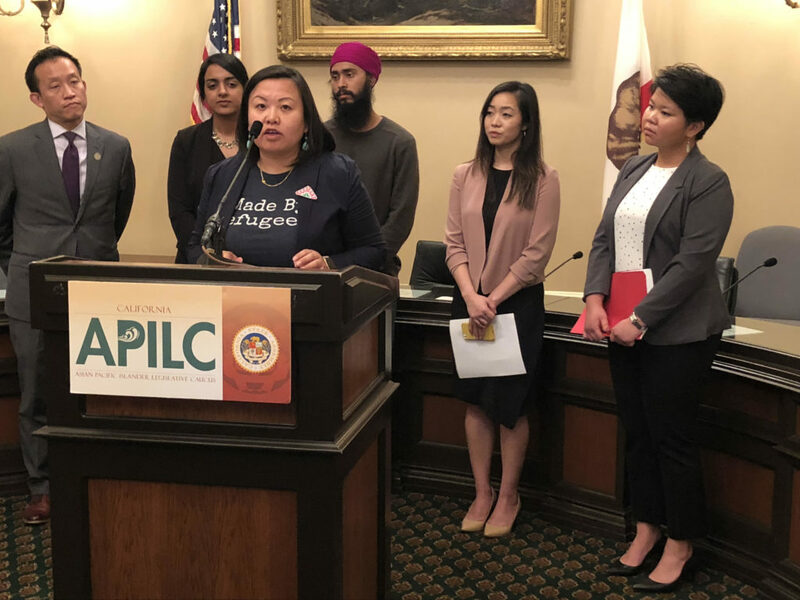 SEARAC advocates for an increase to at least $93.4 million, which would provide additional resources for community based organizations to conduct culturally relevant and linguistically appropriate community outreach and education to California’s hard-to-count communities. Gov. Newsom proposed to expand full-scope Medi-Cal for undocumented adults, 19-25 years old. SEARAC and other advocates will be pushing for state legislation (below) that would expand full-scope Medi-Cal for undocumented population regardless of age. Additionally, advocates are requesting for a state investment of $15 million to extend funding for health navigators. This bill would extend eligibility for full-scope Medi-Cal benefits to individuals of all ages, if otherwise eligible for those benefits, but for their immigration status. AB 4 will be heard in Assembly Health Committee on April 9, and SB 29 will be heard in the Senate Appropriations Committee on April 8. My Path to Health, a pilot project of the County Medical Services Program Governing Board to increase access to health treatment and preventative health care services, is currently enrolling up to 25,000 undocumented residents within 35 designated California counties. Increase 2,500 enrollment slots at the UC system. This bill would add the completion of a one-semester course in ethnic studies, in either the subject of social studies or English, based on the model curriculum in ethnic studies developed by the Instructional Quality Commission, to the high school graduation requirements commencing with the 2023–24 school year. The bill has moved out of Assembly Education Committee and into Assemble Appropriations. Visit California Department of Education to stay up to date on the progress of California’s Ethnic Studies Model Curriculum. 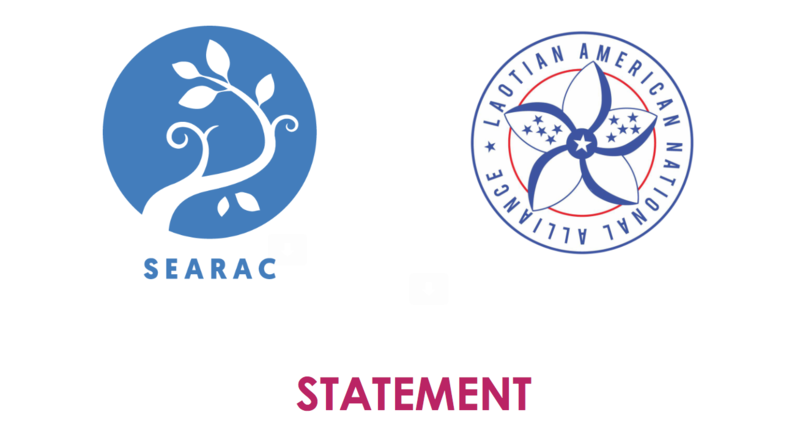 To submit a letter of support, contact SEARAC BMoC Coordinator Gabriel Garcia at gabriel@searac.org. This bill would require the commission to develop and submit to the state board a model curriculum on the history and cultural study of Laotian refugees, on or before Dec. 31, 2022. The bill will be heard in Assembly Education Committee on April 10. To get involved or submit a letter of support, please contact Lily Liemthongsamout at li_liem@live.com. This bill would prohibit an officer, employee, contractor, or employee of a contractor of the California Department of Corrections and Rehabilitation from facilitating, allowing entry to the department’s premises, or otherwise authorizing an employee or contractor of a private security company to arrest, detain, or take into custody an individual in the department’s custody for immigration enforcement purposes. This bill will be heard in Assembly Public Safety Committee on April 9. 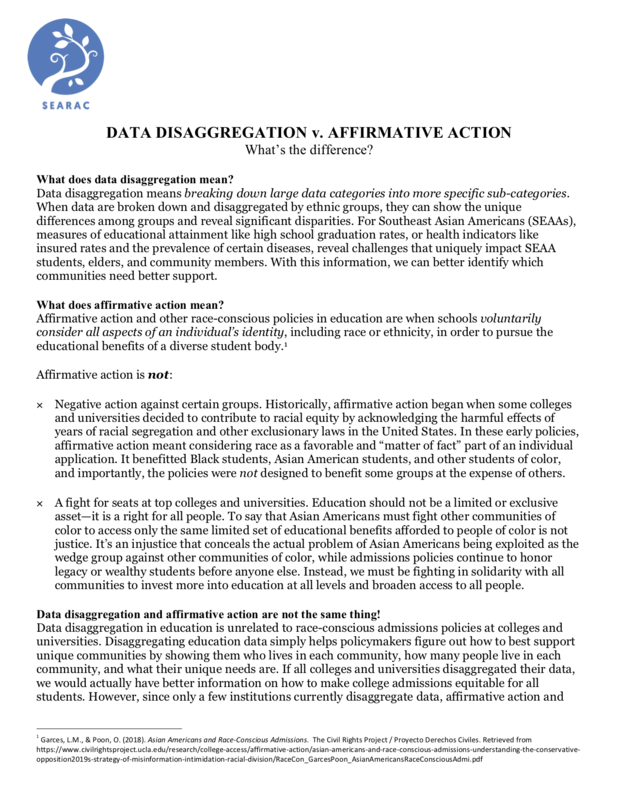 This bill would express the intent of the Legislature to establish the Statewide Longitudinal Student Database to collect and store data regarding individual students as they matriculate through P–20, as defined, and into the workforce. The bill would require the commission to convene a review committee for purposes of advising the commission on the establishment, implementation, funding, and ongoing administration of the database. This bill would authorize the remains of a person to be buried in those cemeteries if the person was naturalized following the federal Hmong Veterans’ Naturalization Act of 2000, and was a California resident at the time of the person’s death. Redefine the circumstances under which a homicide by a peace officer is deemed justifiable to include when the killing is in self-defense or the defense of another, consistent with the existing legal standard for self-defense, or when the killing is necessary to prevent the escape of a fleeing felon whose immediate apprehension is necessary to prevent death or serious injury. Additionally bar the use of this defense if the peace officer acted in a criminally negligent manner that caused the death, including if the officer’s criminally negligent actions created the necessity for the use of deadly force. Affirmatively prescribe the circumstances under which a peace officer is authorized to use deadly force to carry out an arrest, to prevent escape or to overcome resistance. The bill will be heard in Assembly Public Safety Committee on April 9. Please visit the Alliance of Boys and Men of Color.